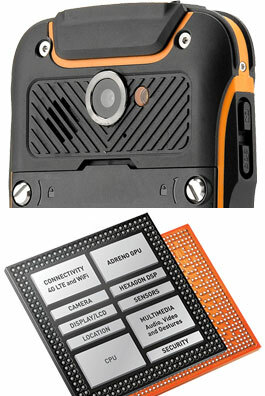 Extreme-Smartphone (by X-Systems) launched X-Tel 9500 V2. An updated extreme, outdoor waterproof smartphone with updated hardware- and updated software features. 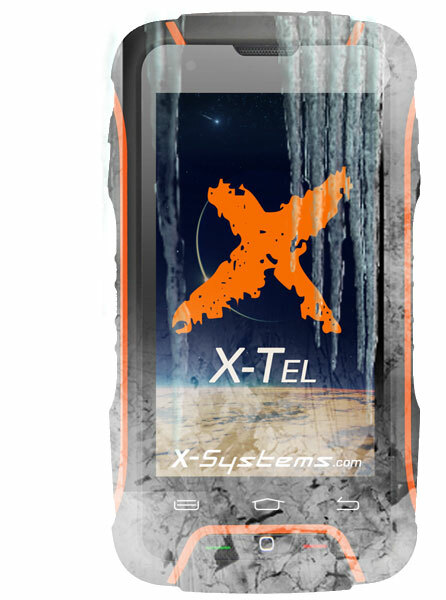 The X-Tel 9500 V2 is the ultimate outdoor & waterproof smartphone. GET YOUR X-TEL 9500 V2 TODAY ! 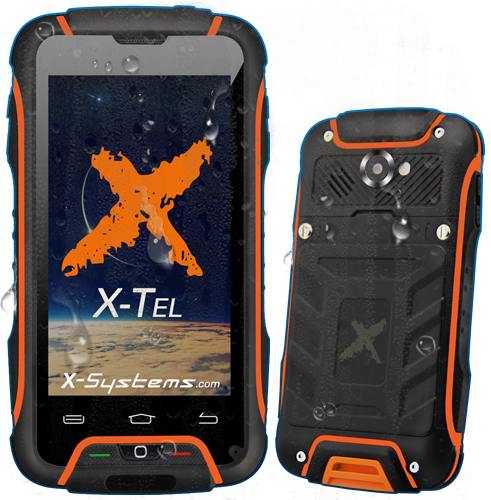 The new V2: X-Tel 9500 4G is specially designed to be extreme tough, powerful, waterproof and thin. 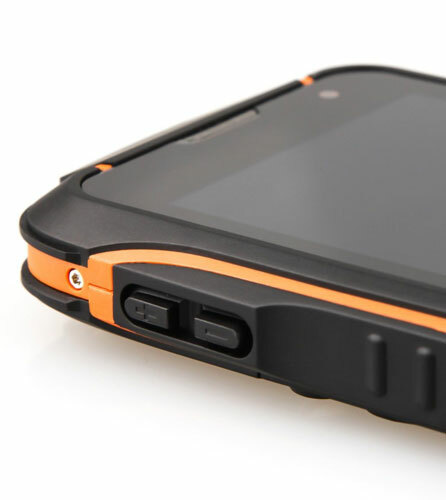 This is a fully rugged water-, dust-, vibration-, drop-, and shockproof Android outdoor smartphone. 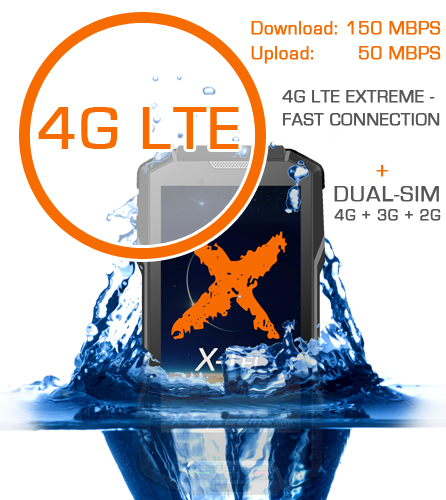 The X-Tel 9500 4G V2 has an extreme and outdoor design that can easily survive under water for a couple of meters for 2 hours. Not only can it survive under water for 2 hours but i can also fall from 1 meter without getting any damage. The smartphone can easily operate in extreme weather conditions, it can operate from -20 to 80 °C. Besides the great tough design, the smartphone has the newest and most advanced technical specifications for the ultimate outdoor experience. It has an amazing high definition camera by as much 13 Mega Pixel to capture the most special moments of your journey and it’s completely submersible up to two meters. Perfect for all outdoor activities. The new V2: X-Tel 9500 4G is your dream smartphone as a construction, agriculture, industrial and outdoor professional, basically an outdoor practitioner. The X-Tel 9500 4G V2 Is specially built fort he most extreme weathers, activities, pressure and the reaction is as fast as you could possibly imagine. The X-Tel 9500 has a multi-touch, beautifully designed Full HD screen using Gorilla Glass 3.0. Not only has it a fantastic design but you can also use it while wearing gloves or having wet hands which makes this a tough, rugged but beautiful smartphone for outdoor and extreme activities. The X-Tel 9500 V2 makes use of One Glass Solution (OGS) touchscreen technology, which reduces the thickness of display, by removing unnecessary layers out of the glass from the traditional capacitive touchscreen. The touch panel layer is directly underneath the Gorilla Glass 3.0. The benefits of an OGS interface include smoother multi-touch responsive gestures such as zooming and scrolling. Experience the superlative graphic performance of the X-Tel 9500, it brings your content to life. With its sleek screen-to-body ratio and streamlined rugged design the X-Tel 9500 is a seriously large screen smartphone that easily fits into your hands and pocket. The large high-definition X-Tel screen and high amount of pixels per inch, makes colours brighter, details sharper and images life-like whether you’re reading, watching, or working. Gorilla Glass is slimmer, give access to brighter images, has a greater touch sensitivity and is overall stronger than its predecessor. The 4.0” high definition “Gorilla Glass 3.0” display is ultra-sensitive, sunlight readable, completely waterproof and makes usage of IPS (In-plane switching) wide-angle technology, for clear and unmatched viewing experience from all angles. The large 4.0 Inch X-Tel 9500 V2 IPS display is ideal for company presentation or sharing your pictures with surrounding people. Enjoy a bright and colorful view of the world with this impressive screen. The X-Tel 9500 V2 gives you powerful high definition image performance without sacrificing mobility. This X-Tel has the perfect combination of screen proportion, natural high definition image quality and handheld mobility for seamless video playback, advanced gaming performance and smooth graphics. 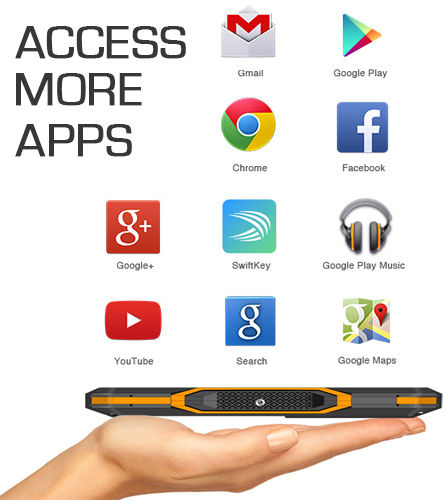 The X-Tel 9500 V2 outdoor & waterproof “Extreme Smartphone” of only 16.3mm thinness is especially built to withstand the toughest outdoor environments and extreme rough handling. Independently tested and certificated by authorized organisations, the X-Tel 9500 V2 is certificated to military and industrial waterproof IP68 rating. IP68 stands for 1 meter waterproof-submersible for 30 minutes, which means you can use this extreme waterproof smartphone underwater in swimmingpools and open waters. The outdoor & waterproof housing makes this X-Tel 9500 V2 waterproof-submersible and protects the sensitive internal components against shock and vibration damages. The back-cover is secured with the supplied strong stainless steel bolts. 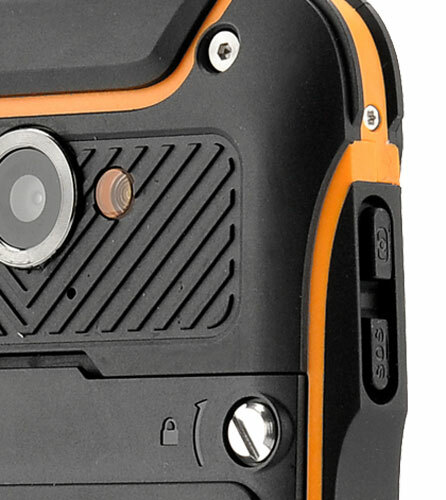 This top-notch waterproof smartphone is more extreme than any other waterproof smartphone. As many smartphones claim to be waterproof, they are mostly water resistant for a tiny period of time. Next to that they are water resistant up to 5 cm of water. With the X-Tel 9500 V2, owners may jump a swimming pool or open water without damaging the smartphone internal components. protect it from knocks and drops. The waterproof casing will resist impacts and drops and the screen is a side of being waterproof also scratch resistant. This means the X-Tel 9500 V2 is the perfect smartphone for outdoor and water environments use, or use day-to-day in hard working environments. We present you the invincible Extreme Smartphone… well it truly is victorious in any aspect. We can say proudly it’s one of today’s best phone in its durable quality, high finish as well as technical specifications. This X-Tel 9500 comes with an impressive 2GB RAM and 16GB ROM. The X-Tel 9500 does everything much faster and it has enough horsepower to tackle everyday’s use. It’s your mobile outdoor freedom at the speed of the light. The processor is asynchronous, which means that each core separately can go on and off. You get exactly the power you need, when you need it, without wasting any. The Quad Core result in extremely efficient multi-tasking, comparing to Dual Core processors. Live more actively then ever before with lighting fast 4G LTE, fast speed without any delays. Prepare for instant gratification. Super-fast LTE networks offer anytime and anywhere access to entertainment. Fast data connection means smooth high definition videos over data and uninterrupted VOIP video calls. This Quad Core “Extreme Smartphone” X-Tel has a built-in 4G LTE modem, allowing you to take the advantage of high-speed mobile Internet connections up to 150 Mbit/s for downloading and 50 Mbit/s for uploading. Enjoy mobile Internet with the speed of a CAT4 cable, almost 6 times more than the previous-generation device. Take your X-Tel phone with you on every short travel or a weekend trip and charge it when your back home! The X-Tel 9500 has a powerful 3800mAh battery, a battery that last longer and packed for any outdoor or action sport adventure. This X-Tel smartphone has enough capacity for 20 days stand-by usage time! The battery has a special designed cell structure which makes the battery immune to vibrations and it absorbs the shocks better. The battery has a longer battery life time due to the strong and tough cell structure. 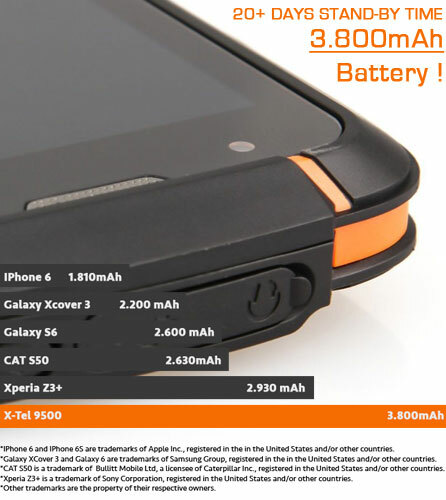 With the X-Tel 9500 and its 3800mAh battery you will be powered and connected for the whole trip. Never loose a moment of mobility! Choose your favorite provider that fit your needs, requirements or pricing. Don’t you like to be tied to one provider!? No problem. That’s why the X-Tel 9500 smartphones are all unlocked in our official webstore. Just choose your own favorite provider that fits your usage by sim-only contract or prepaid card and you are free to go. The X-Tel 9500 “Extreme Smartphone” supports EDGE, 2G, 3G and the 4G LTE networks, however X-Systems cannot take any liability for the connection or reception of your telecom providers network and its range. Dual-SIM phones can use two different providers even from an other country, you can switch calls between your two different telecom providers or you can switch between private and business calls within one single provider. The internet connection can only be taken from one provider of your choice. There is the possibility to take your applications wherever you go, no matter how rough the terrain will be. With open source Android you’ll have complete access to all the things you need. Download your favorite outdoor applications or use one of the many pre-installed ones. There are more then a million applications available for this X-Tel. Google Play offers various consumers as well as business related applications, which are practical, time efficient or just fun to use. Android OS can use one of the many applications on the store that can help you get your job done quickly, or it can run your custom application in a open or closed network environment. The X-Tel 9500 is a complete new rugged handheld smartphone, it offers the opportunity to match on the personal and professional needs. This X-Tel is designed for consumers and businesses that demand a mobile device that last longer then any regular smartphone. The X-Tel 9500 is ideal for fast entertainment multimedia and direct business 4G LTE Internet usage. 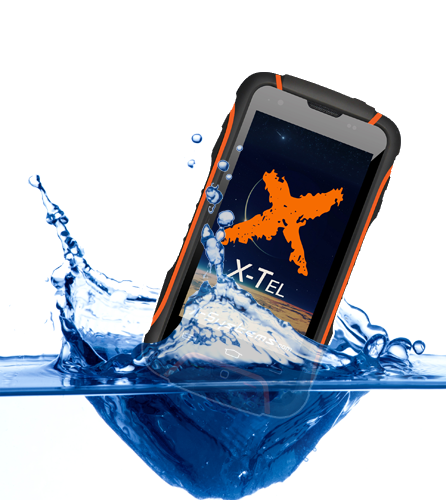 Take the X-Tel rugged waterproof Android phone wherever you go and even under rough circumstances. It’s the ultimate phone for the active athletes, military, first aid responders, farmers, industrial and construction workers that demand the very best in any expect. A smartphone designed to fit your active lifestyle. Answer Call- + End Call- + SOS Panic- Buttons for ultimate usage & safety. The new X-Tel 9500 V2 has a side “SOS PANIC” button which you can press for 3 (three) seconds and automatically dials a pre-set emergency number. Within the X-Tel 9500 V2 smartphone is a standard application named “SOSNumber” where an emergency number can be added. Traveling abroad no troubles, you can always change the emergency number related to its country. Would you like to add your office number as emergency number, even this is possible. Just add the number within this application. 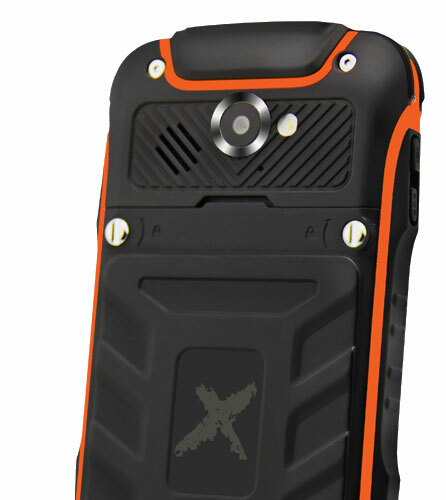 Safety and security first, that is the strength of this waterproof smartphone the EXTREME SMARTPHONE X-Tel 9500 V2. The SOS panic button is one of the many practical pre-installed outdoor tools. Share your tune loudly, start your party on the fresh beach or in the rainy forest. With this X-Tel you’re able to play sounds by the powerful 100DB speaker. The 18mm speaker has a built-in amplifier for an immersive sound performance. Music & effects becomes breathtaking realistic by adding dimension to the sound. The X-Tel 9500 “Extreme Smartphone” creates a pure sound with long acoustic transmission, the waveform is longer and consists of a single frequency with auto-balancing. The distortion-free and immersive clear loud sound is as impressive as the phone it self. Enjoy an unrivalled audio experience with breakthrough sound features. The X-Tel 9500 V2 comes in 4G LTE DUAL-SIM capability that enables users to switch between private and business calls easily. When traveling abroad, this functionality is more than convenient. 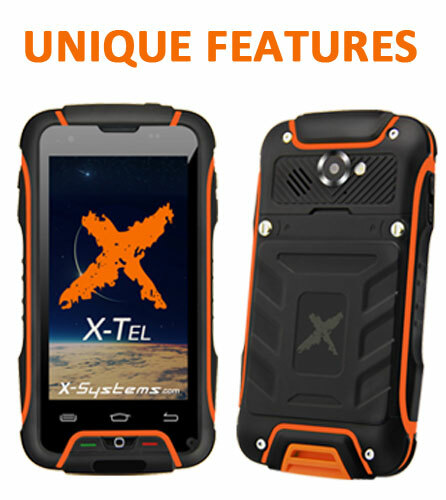 This X-Tel 9500 “Extreme Smartphone” is specifically engineered to be fully protected against drops, shocks, spills, vibration and more. 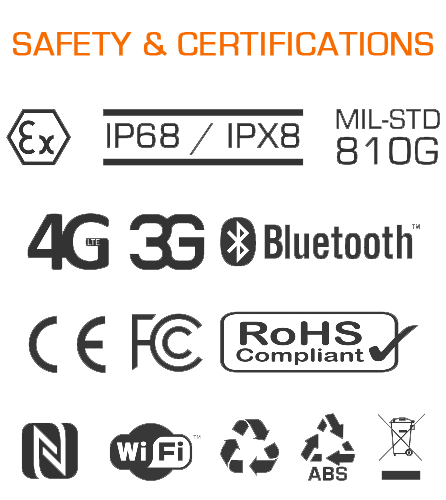 The X-Tel 9500 HEXA-proof smartphone is built to industrial grade IP68 / IPX8 ratings and gives the highest standard of protection. 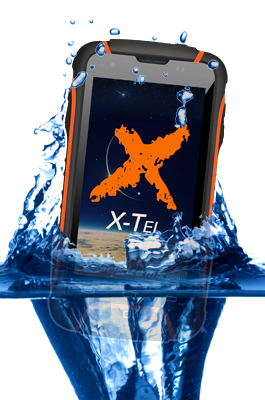 The X-Tel has an powerful internal frame and highly scratch resistant tempered touch screen glass, you can be sure the X-Tel will withstand the toughest environments and the most extreme conditions. The X-Tel 9500 is designed to withstand a drop from one meter at any angle, it’s completely waterproof and reached MIL-STD-810G military standards. The X-Tel 9500 is ready for whatever you can put it through. Express yourself in colour. The innovations of the X-Tel 9500 go far beyond its quality or durability. A wide range of personalization options and tools make it the most personal rugged 4G LTE smartphone. 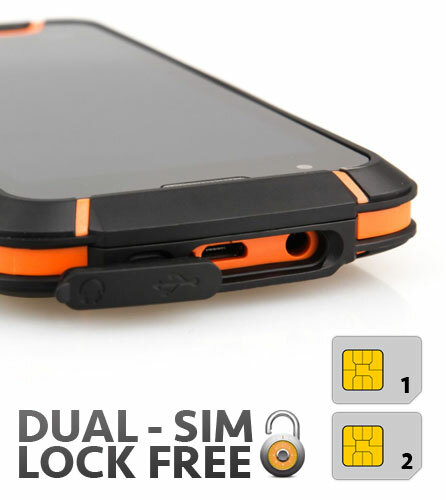 Choose between the two available colours black or orange for X-Tel 9500 and make Android yours, customise without confusion. The X-Tel lets you change everything with just a couple of taps. You don’t have to be a coder or developer to get the smartphone just the way you want it, the way it fit your lifestyle. The features such as widgets, notifications, wallpapers and applications makes the smartphone personal. The X-Tel 9500 lets you create personalised wallpaper from your favourite photos or images, and gives you directly a quick overview of the information you request and much more.